One of our favourite apps is by the British Red Cross who have an amazing, and free, first aid app. Their Baby and Child First Aid app is full of easy to follow instructions, advice and videos on how to deal with everything from allergic reactions through to burns. We hope that you never ever need it but as a helpful tool to deal with an emergency it is definitely one worth downloading onto your phone. One of the first tips that we give parents of our newborns we see in our sessions is to turn their head. It is a really helpful tip and so helpful for your baby. When your little one is born, their neck can’t yet support the heaviest part of their body and their head falls to one side. It is a few months before they’ll have the strength and control to hold their head straight (we call it in the midline) and until then your little one needs your help to ensure that their head is supported but also that they experience their head position in both directions. The danger is that if your little one’s head falls to one side that the muscles on the opposite side of their neck lengthen and the ones on the side they turn to shorten causing stiffness and torticollis. They can also develop a flat spot on their head where they lie. So please help your baby by turning their head, place a hand on both sides of their head and gently turn their head for them. When they are lying, sleeping, in tummy time, in a carrier or car seat, turn their head. Once they are able to do this themselves you are able to leave them to it but in the meantime, please turn your baby’s head, it is massively beneficial! Finger puppets are some of our favourite toys and they are brilliant for doing some really simple tracking activities for visual development with event the littlest babies. 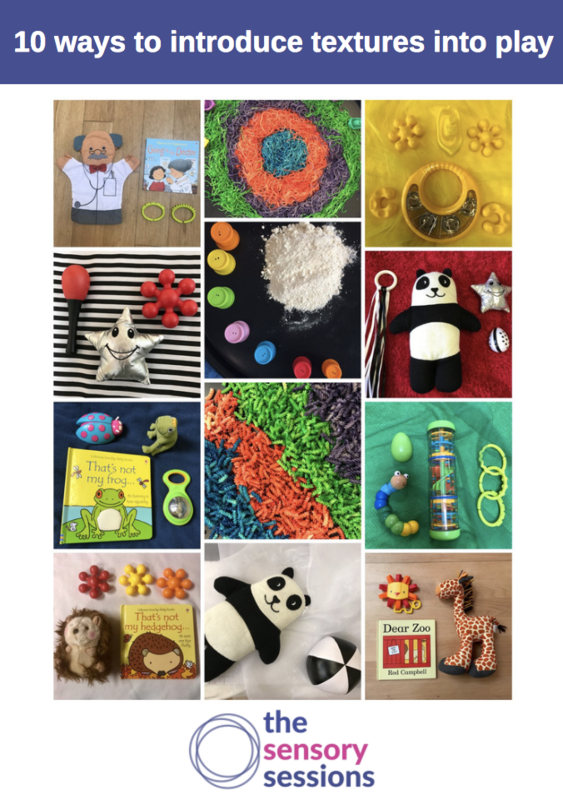 When our little ones are born their eyes don’t yet work in partnership so they need lots of practice on focusing on objects to help them team their eyes together and puppets is such a simple and brilliant way of helping them. When your baby is looking at the puppets they are developing their ocular motor control by doing lots of tracking activities, amazing for their visual development. For our littlest babies this is an activity to do when they are lying, take your finger puppet and hold it about 6 inches from their nose in a static position, watch them focus on it and take it all in. Contrast finger puppets are brilliant for this and we particularly like black and white ones like the zebra and contrast ones like the clownfish nemo. Once they are able to fix on the puppet move it back and forth very slowly over their eyeline. Be careful to do it towards their nose rather than forehead so that little necks aren’t tilting backwards. Rub the finger puppet against their hands, feet and face to let them experience the texture. Repeat this often, everything that our baby learns is from lots and lots of repetition so never be scared to revisit this activity often. Once they have done lots of tracking and developed both their fixed gaze and ability to track from side to side you can move the activity on by doing some slow zooms towards their noses, tickling them with the puppets, and doing some slow ‘s’ shapes backwards and forwards. 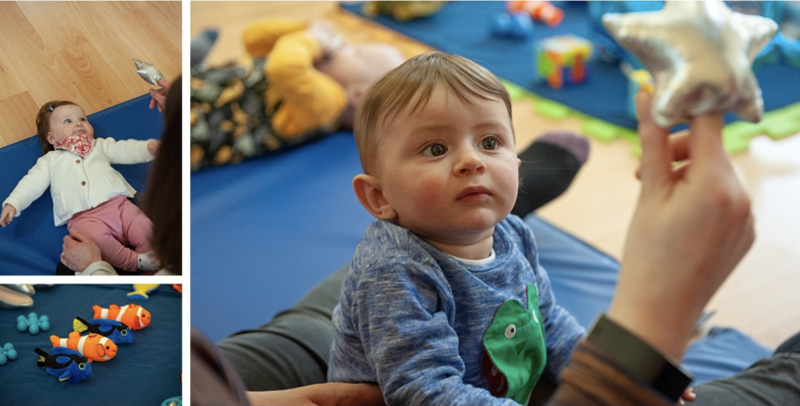 For our sitting babies again hold it in front of them and, while they are supported if they are still getting their sitting balance, do some zooms towards their nose and lovely ‘s’ shapes. Help them with their hand – eye co-ordination by holding it in front of them and encouraging them to reach with both hands for the puppet. Once they have developed this skill you can hold it to one side for them to reach with the hand on the same side of their body for the puppet. the zebra, great contrast toy that feels amazing! the clownfish, another great contrast toy and an excuse to play ‘under the sea’ song! Humpty Dumpty, (available to purchase individually or as part of a nursery rhyme set) accompany this with a book too. Safety first – As always keep your little one in eye sight and arms reach at all times when playing. Do check out our learning library which gets updated weekly with baby development articles! Introducing textures into play is amazing for our little one’s brain development, it gives them early exposure to the multi texture environment we live in and can help avoid sensitivities in later life. Here are 10 ideas on how you can add texture into play at home. 2. Books – books are available in lots of textures from paper to board and fabric to pvc. ‘That’s not my’ books include a different texture on each page. 4. Use your links – links are one of our favourite toys, for their single colour and texture, loop chiffons or muslins through them to make a two texture toy. 5. Create a themed play space taking 3 or 4 toys around a theme and have a great conversation with your little one around the toys. 6. Consider the fabrics that your little one is lying on. Add towels, fleece blankets, chiffon or cotton so they can feel different textures under them. 7. Ballpool with a single layer of balls and some fabric toys in it, helps our little ones feel where their body is in space while engaging with the different textures. 7. For our weaning babies add a spoonful of yogurt or cool soup onto their high chair tray to allow them to touch, feel and play with it. 8. Messy play – for our little one’s edible messy play is most appropriate as they will try and pop it in their mouths. Consider blitzing bread, making edible sand, letting them play with jelly & custard, letting them play with soup and bread. There are messy play ideas on our blog including how to make play dough, cloud dough, colour pasta and make sand. 9. Let your little one feel the grass under their feet while playing with familiar toys. 10. Add different textures into bath time, consider squeezing toys by munchkin, bowls, mesh and fabric bath toys. The fabric and mesh toys feel different wet and dry so give your little one opportunity to feel the different textures. Have lots and lots of fun. Introducing textures to your little one is really helping to build their brain so they are prepared for the multi texture environment that we live in. As always safety first – supervise your little one during any play. Keep them in eye sight and arms reach at all times. Our baby’s sense of hearing is the most developed sense at birth and that is why they are able to conduct a hearing test within hours of them being born. It can take many months for our little ones to understand the noise that they are hearing and be able to identify where a noise is coming from and this is where we can help them. Dive into your toy box and have a look for some toys that sound differently. For young babies we are lying them down to play on their backs and shaking the toy in front of them starting and stopping frequently so they can look at the toy and listen to the noise. The next stage is to hold the toy to the side, shake it and see if you they can turn their head in response to the noise to identify where it is coming from. Your mission then is to try another toy so they begin to understand that things you can shake sound different. Once our little ones have some head and neck control you can do this activity in tummy time too. As their sense of space and grip develops you can give the the toy to shake and encourage them to move it, this helps them develop their gross motor control (the bigger muscles in the body) as well as their fine motor control, the smaller muscles in the body. Halilit Rainmaker – such a great visual toy too! Making your own musical shakers is easy, take a bottle and fill it with things that look and sound different. Great things to consider are beads, lentils and pasta. Please make sure that your little one can’t get into the bottle and that the lid is secure to ensure that it doesn’t become a choking hazard. This is an activity to keep repeating and scale it up as your little one develops. Have lots of fun and we’d love to hear how you get on!